Cool off to the beat of jungle rhythms—and splashes of water—pounded out by this circle of “leaky” tiki totem poles. Rumbling drums and an odd mist invite you to stand in a circle of wood statues, known for shooting water at passers-by. Make your way inside a sacred gathering of towering totems and stand beneath the weathered, wooden faces of a primeval culture. As the drumming of the Ancients echoes amid an ethereal fog, look out—those mischievous tiki gods are known to pump water at all who enter when they least expect it! 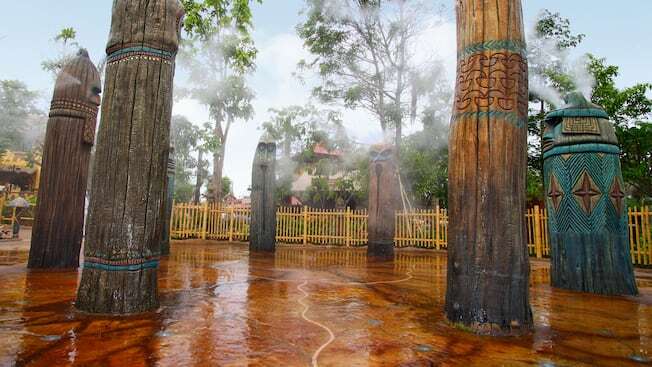 Located across from Jungle River Cruise, Liki Tikis is a Polynesian-inspired water-play area for adults and kids looking to relax, refresh and enjoy a break from the excitement of Adventureland in Hong Kong Disneyland Park. Across from Liki Tikis is an area filled with tribal drums where you’re invited to pound out your own boisterous beats.